Product Information - REAL Design Inc. Designed to have all the advantages of 5 separate fixed-height wedges in one wedge, the Height Adjustable Wedge easily adjusts in 2-inch increments to create wedge heights of 4', 6', 8', 10' and 12'. To suit different needs, the wedge can be adjusted to be weight bearing on the forearms, weight bearing on extended arms, or non-weight bearing. The Height Adjustable Wedge can also be used for supine as well as prone positioning. Made of durable, tear-resistant vinyl with a urethane foam padding for comfort, the Height Adjustable Wedge will add color and playfulness to any therapy setting. 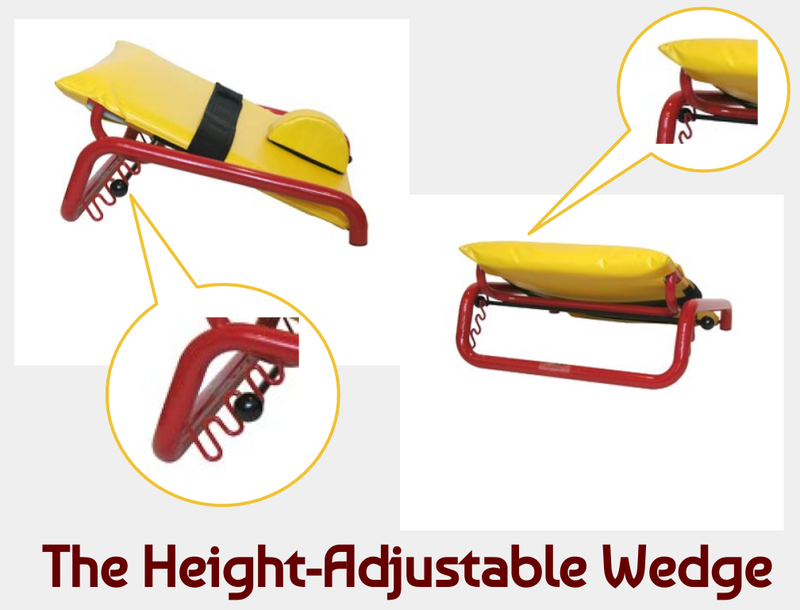 The sling design of the wedge helps keep the person gently cradled in a midline position. A hip belt and abductor are also included. The sturdy steel frame is light-weight for easy portability. The Height Adjustable Wedge by R.E.A.L. Design ...we combine fun with function!